Madrid Art & its galleries appear frequently in reviews of world collections and with good reason! The sheer variety available from a Spanish culture that prides itself on expression is amazing as well as educating. Where better to see these great masters than in the country´s capital, Madrid! Thanks to the great demand from the Spanish public entry prices remain low and in some cases even free. Couple this with the fact the major galleries are almost on top of each other... Why not take a relaxing day & allow the Art, sculpture and design to take you away to a different time and place? Check here for which bus routes pass through the Madrid Art zone! The permanent collection is a more than 1,000 piece history of Art starting from the 13th Century through to today. Trends & patterns as well as new and old styles are combined in this collection. Augumented by regular exhibitions which focus on one particular theme or timeframe this is a great introduction to art through the centuries! Open Tuesdays to Sundays inclusive from 1000 to 1900. Tickets can be bought between these hours until 1830 from the ticket booths at the entrance. Closed 1st Jan, 1st May and the 25th Dec. Additionally between the 24th & 31st Dec there are restricted opening times in place from 1000 to 1500. Housing an extensive permanent collection of Spanish and foreign masterpieces permanent exhibitions include: probably the most extensive collection of Spanish painting through the ages, Italian paintings 1300-1800, Flemish painting 1430-1700, French painting 1600-1800, German painting 1450-1800 as well as scultupure and decorative art! Regular showings of Picasso´s work are also not to be missed! Open Tuesdays to Sundays inclusive from 1000 to 2000. Tickets can be bought between these hours until 1930 from the ticket booths at the entrance. Closed 1st Jan, 1st May, 25th Dec and Easter Friday. Check out our NEW full and in depth review of the Museo del Prado here! The place to visit for the best in impressionist art! A huge collection of Dali and Picasso is on permanent show with additional exhibitions of other famous impressionists! Open Mondays to Saturdays from 1000 to 2100 with Sunday hours being 1000-1430. Closed Tuesdays. Tickets can be bought between these hours until 2030 from the ticket booths at the entrance. Closed 1st & 6th Jan, 1st & 15th May, 9th Nov, 24th 25th & 31st Dec. Looking for accomodation in the center of the Madrids galleries? Residents Tip: Madrids galleries and Museums offer reduced price or even Free admission on Sundays. Plan your visits for a Sunday and you´ll save! 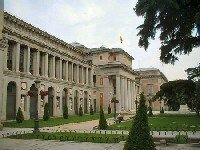 Whilst above are listed the three main galleries Madrid art does not end there! In the barrio Salmanca during the working week there are a number of small private sales galleries which open for the morning (roughly until 1400) and then again in the evening (1700-2000). A cheaper option is the "El Rastro" market held next to metro La Latina which showcases Madrids latest artists works in the giant street market every Sunday morning (0800-1400). During the rest of the week a number of private galleries in this area sell paintings, sculptures and just about every type of art imaginable. For the Best of Madrid Art you need not do more than walk the streets and stop at small tapas bars! Here you will find the decoration applied, be it tiles, painting, sculpting or simple architecture enough to satisfy even the most ardent critic! Remember, this country and in particular Madrid, Love to express! Check out some of Madrids other attractions as the Art scene is not all the city has to offer!